Back in 1974, law school friends Stephen “Steve” Rossman and Charles “Chuck” Baumberger opened the doors of their Miami plaintiff’s law firm. Four decades later, they are still trying cases, still partners and still friends. Through the years, the two founders — along with longtime managing partner Manuel “Alex” Reboso and Howard Spier, a nationally known railroad attorney — have been widely recognized for their leadership in the legal profession and in charitable causes. Both the firm’s founders have deep roots in South Florida. Baumberger was raised here and grew up with a lasting interest in history and political science. He chose law as a career, and enrolled at the University of Florida College of Law. Rossman, whose family moved to Miami when he was in high school, also planned to become an attorney early in life. 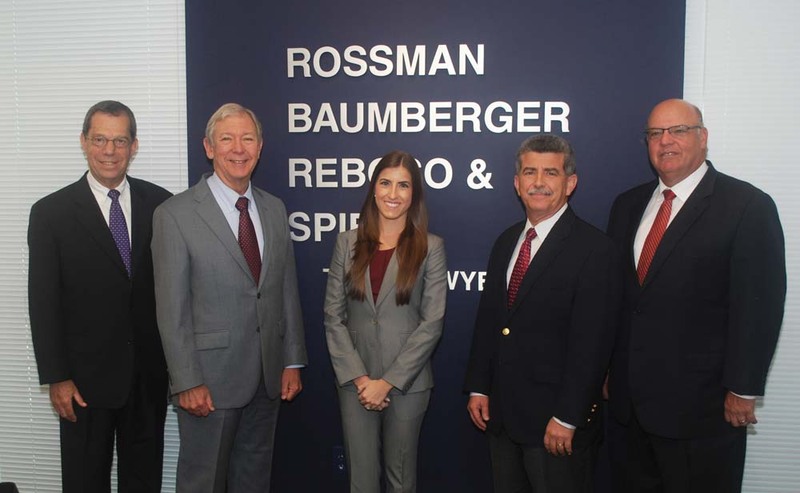 Both Rossman and Baumberger are board-certified in civil trial law, as is Reboso, and the firm has achieved many multi-million dollar verdicts and recoveries for its clients. “I’m also proud that we are known for our professionalism and civility,” adds Baumberger. On January 1, 2016, Baumberger became president of the American Board of Trial Advocates (ABOTA), a national group of plaintiff and defense advocates. “Our mission is to preserve the right to trial by jury, while raising the level of professionalism in the courtroom,” he says. Baumberger will also continue ABOTA’s push for civic education. “We have concentrated on math and sciences, but we cannot forget the importance of teaching our children about civics, as well,” he adds. A former president of the Florida Justice Association and the Dade County Trial Lawyers Association, Rossman has also been a leader in charitable organizations. After his daughter Karly was diagnosed with a neurological disability nearly 30 years ago and placed in an Easter Seals’ school, he became active in the organization as a volunteer, fundraiser, board member, Miami chair and national director, ultimately serving, from 2010 to 2013, three terms as Easter Seals international board chair. In October 2015, Rossman received the Justice Joseph Story Award from the Dade County Bar Association for his work on behalf of the powerless. He also recently received the Fran Peacock Coker Community Service Award from the Florida chapter of ABOTA, which cited his “selfless advocacy for civic and philanthropic causes,” in addition to his professionalism, leadership and sterling record as a lawyer. With his experience in all areas of railroad operations, Spier works with safety investigators and nationally recognized experts to reconstruct the cause of a railroad accident. He represented several families in the 2002 crash of the Amtrak Auto Train in Crescent City, Florida, and in the 2005 Norfolk Southern train derailment in Graniteville, S.C., that caused a tank car rupture, sending a cloud of deadly chlorine gas into the community. One of Spier’s proudest accomplishments involves an occupational hearing loss case he handled in the 1990s against the Southern Railway that went all the way to the United States Supreme Court. “Before that, locomotive engines were equipped with very loud horns located behind the ears of the train crew,” he says. After this case, the railroads retrofitted their locomotives by relocating the horns and also instituted a nationwide hearing conservation program that is responsible for protecting the hearing of thousands of railroad workers. As a trial lawyer, Reboso enjoys being in the courtroom. “I’ve always thought of myself as a teacher, and that’s what I do in my practice — explaining our case to a jury.” A past president of the Miami Dade Justice Association, Reboso also enjoys educating Miami-Dade high school teachers and their students about the nation’s civil justice system. In 2007, he was awarded the W. McKinley Smiley, Jr. Award by the Florida Justice Association for mentoring young lawyers in Florida.